There is no better feeling like walking through the door after a tough day and being welcome with a great smile from your furry companion who is always happy to see you home. Every dog owner will tell you that owning a dog has improved their lives in untold ways. Having a dog is full of fun. if you have been considering getting a dog yourself, there are certainly many different reasons why it is a good idea to do so. There are a lot of benefits this furry friend will bring to you and your family and you will enjoy the benefits that come with having a tail-wagging companion is in your home. Believe me, life with a Fido companion is pretty good (outside the potty-training period). Recently, new research provides further prove that sharing your space with a puppy is really good for you. The research confirmed that dog walkers were more physically active and they spent less time sitting on the coldest and darkest days than non-dog owners were on sunny and warm days. 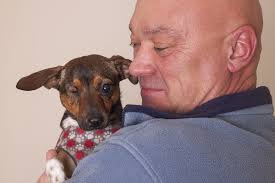 It's also confirmed that having a dog can help lower stress and blood pressure, and that dog owners are more active than their non-dog-loving counterparts. A recent study showed that older dog owners take almost 3,000 more steps per day than non-dog owners—accounting for an extra 23 minutes of movement per day. According to a new study in the Journal of Epidemiology and Community Health, dog owners are significantly very active, especially during the winter. The study looked at 3,123 participants between the ages of 49 and 91 and trailed their movements over the course of one week. Almost 20 percent of participants who owned a dog were more active for about 30 minutes each day—including during chilly weather. According to the project lead Andy Jones, PhD, a professor at University of East Anglia in the UK, they were amazed to discover that puppy walkers were by and large more physically active and spent few time sitting on the wettest, coldest and darkest days than those who don't own a dog were on long, warm, and sunny days,” Time reports. According to Andy Jones “Dog walking is driven by the necessities of the animal. Being moved by something other than our personal needs can be a truly strong motivator and we have to find ways of taking advantage of it when designing exercise interventions in the future.” Just consider this as another motivation to adopt a Fido.